Determining the likelihood of a disaster is a key component of any comprehensive hazard assessment. This is particularly true for tsunamis, even though most tsunami hazard assessments have in the past relied on scenario or deterministic type models. 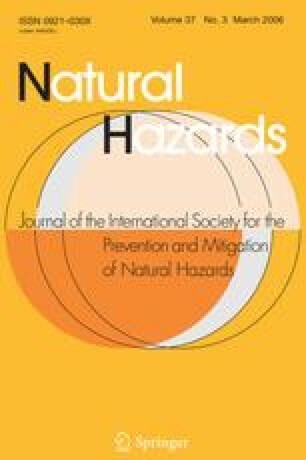 We discuss probabilistic tsunami hazard analysis (PTHA) from the standpoint of integrating computational methods with empirical analysis of past tsunami runup. PTHA is derived from probabilistic seismic hazard analysis (PSHA), with the main difference being that PTHA must account for far-field sources. The computational methods rely on numerical tsunami propagation models rather than empirical attenuation relationships as in PSHA in determining ground motions. Because a number of source parameters affect local tsunami runup height, PTHA can become complex and computationally intensive. Empirical analysis can function in one of two ways, depending on the length and completeness of the tsunami catalog. For site-specific studies where there is sufficient tsunami runup data available, hazard curves can primarily be derived from empirical analysis, with computational methods used to highlight deficiencies in the tsunami catalog. For region-wide analyses and sites where there are little to no tsunami data, a computationally based method such as Monte Carlo simulation is the primary method to establish tsunami hazards. Two case studies that describe how computational and empirical methods can be integrated are presented for Acapulco, Mexico (site-specific) and the U.S. Pacific Northwest coastline (region-wide analysis). * The U.S. Government’s right to retain a non-exclusive, royalty-free license in and to any copyright is acknowledged.